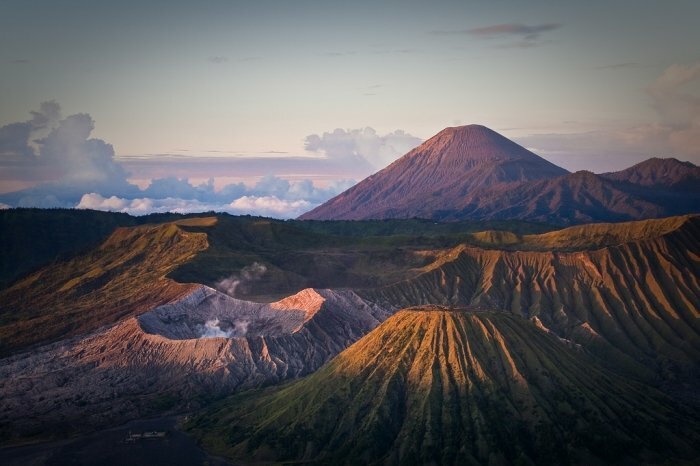 If you’ve always wanted to hike up a volcano, there is no better place to go than Indonesia. Because of the country’s location at the meeting point of three tectonic plates—the Australian, Eurasian and Pacific plates—, it’s home to numerous volcanoes. It’s estimated that there are about 150 active ones on top of many more extinct ones. Active volcanoes include Tambora and Krakatoa, both infamous for their catastrophic 19th-century eruptions. That shouldn’t scare you, though. Eruptions, although they do happen, are still quite rare. At most, you’ll see flumes of smoke and notice a sulphur smell. 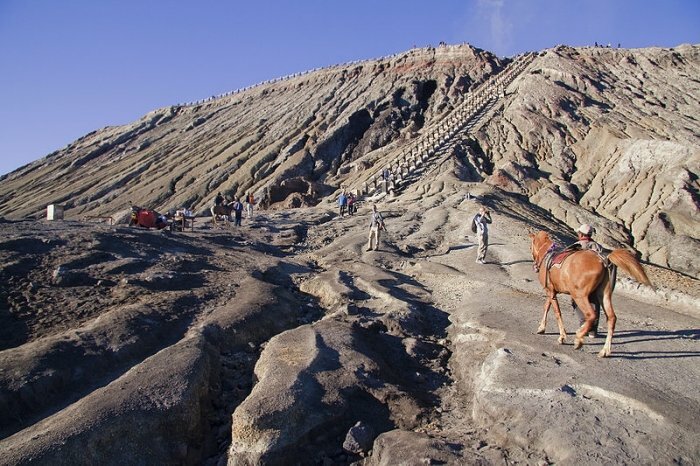 If anything, Indonesia’s volcanoes, both active and extinct, beg to be explored on foot. Luckily, there are countless superb hiking trails running up and down the flanks of many mountains. It’s no surprise that Indonesia is a dream destination for hikers and rock climbers. In this post, we’ve selected Indonesia’s ten best mountains for hiking. All these spots offer downright spectacular views, the perfect reward for the sometimes pretty challenging ascents. The highest mountain in Bali, Mount Agung is 3,142 metres tall and is a spiritually important mountain for the Balinese people, the location of the Mother Temple of Besakih. You can hike up this mountain in six to seven hours, an adventure rewarded with gorgeous views. 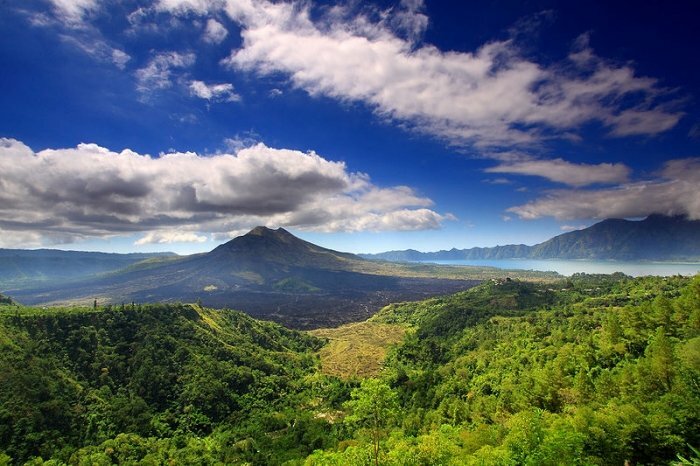 Arguably the most popular mountain for hiking in Bali, Mount Batur stand 1,700 metres tall. Its summit overlooks Lake Batur and the rural landscapes that characterise this popular tourist island. The hike is fairly short, taking about two hours to reach the summit. If you’re spending significant time in Bali, this hike is an excellent activity to do when you get bored of spending time on the beach all day. 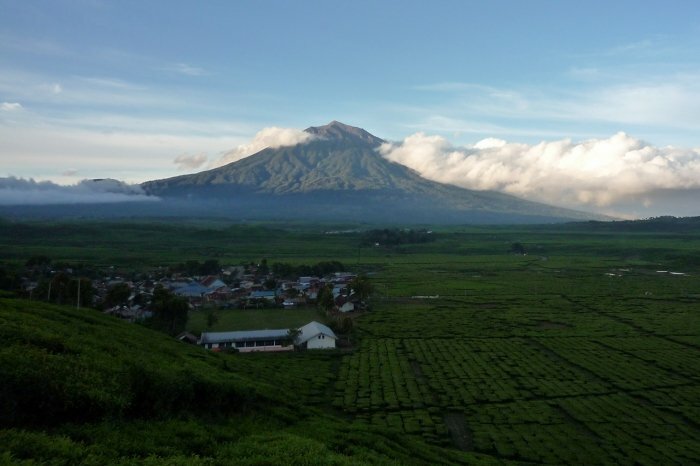 This is the tallest mountain in Sumatra and the highest volcano in Indonesia. 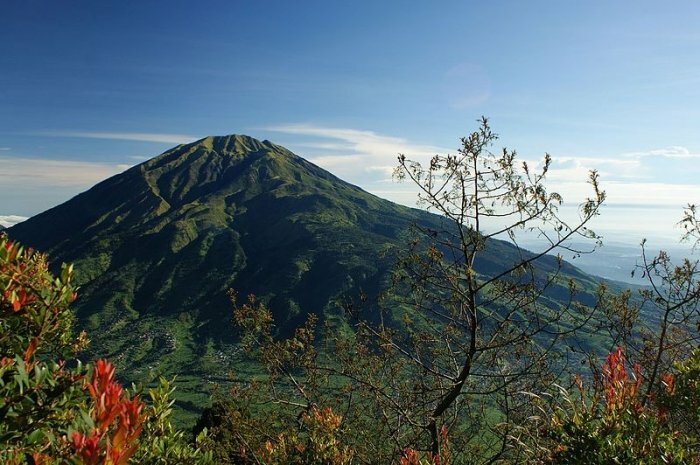 Located within Kerinci Seblat National Park, this mighty mountain can be conquered during a three-day trek. On the way, you might even spot iconic animals like the Sumatran rhino or the Sumatran tiger. 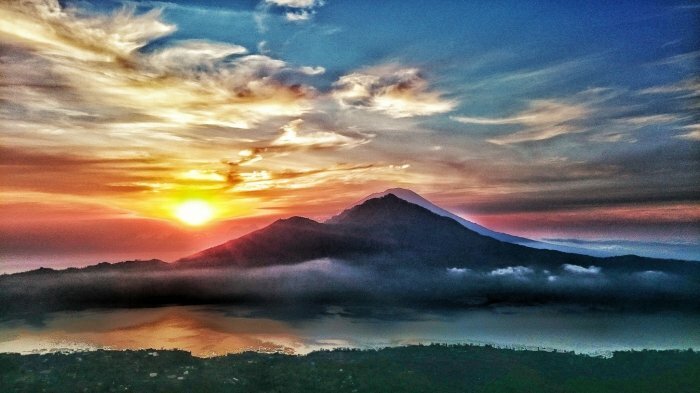 From the summit, you can take in a view that encompasses a rural landscape dotted with fifteen lakes, including Gunung Tujuh Lake, the highest lake in Southeast Asia. 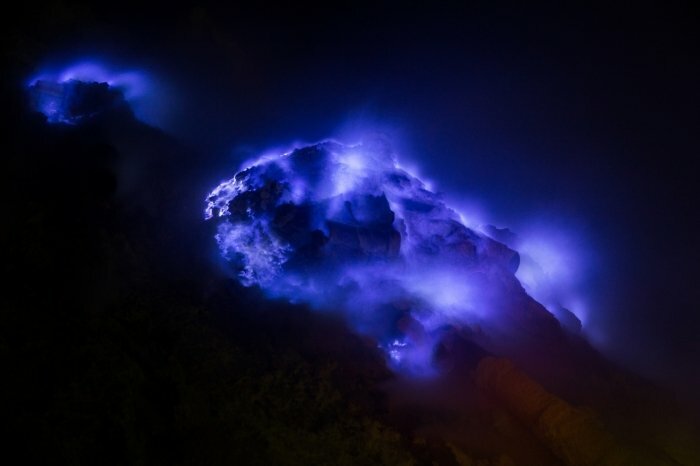 Kawah Ijen—Ijen Crater in English—is a super-popular hiking destination in Java and it’s easy to see why. Hikers go there to see the stunning kilometre-wide crater. This magnificent crater is filled with crystal-clear sulphur water that emits white smoke during the day and blue flames at night. This natural phenomenon is a real spectacle, but remember that the gases are poisonous. Cover your nose and mouth when you’re near the crater. 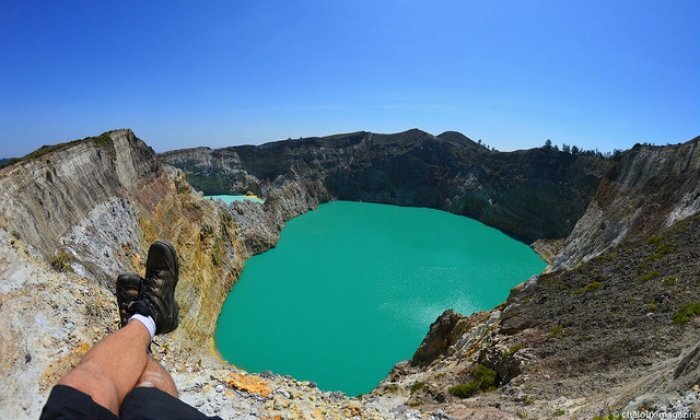 The three coloured lakes at the summit of Mount Kelimutu are arguably the greatest natural highlight in Flores. Each of the three lakes has its own distinct colour, from blue and green to muddy brown and black, the actual colours depending on the season and time. Just seeing these three magical lakes makes the 20-kilometre hike totally worth it. You can also take public transportation to a parking lot, from where it’s a 30-minute hike to the lakes. The greatness of Mount Bromo is known wide and far. Numerous hikers flock to this active volcano to catch the sun rising over an unearthly landscape of volcanoes and barren hills. The most iconic mountain in Indonesia, this is arguably the epicentre of hiking in Indonesia. It’s by far the most popular volcano to hike. And for good reason—the views are unbelievable. Mount Penanjakan lies relatively close to Mount Bromo, also in Bromo Tengger Semeru National Park. This mountain is particularly great because it offers some of the best views of Mount Bromo and its white sulphurous plumes of smoke. The hike to the summit takes about two hours. Try to get there before sunrise. The 360-degree views from Mount Merbabu encompass seven other peaks, creating a panorama that’s worth the hike. It takes more than twelve hours to get to the summit and back down, which is why many hikers opt to camp on the way. Strong hikers might be able to do it in a single day. 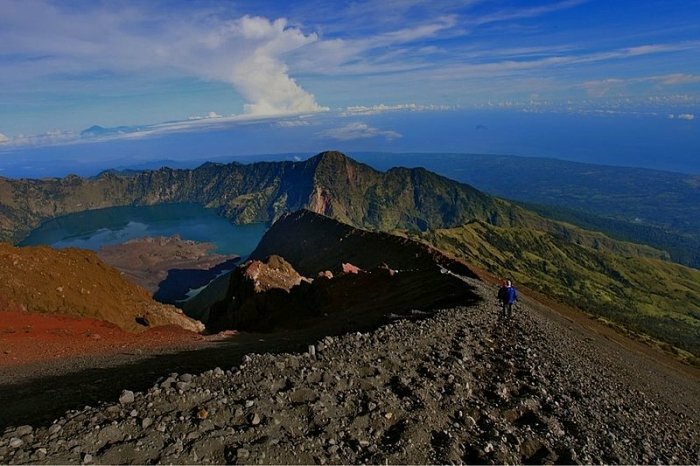 Dominating the landscape on the island of Lombok, Mount Rinjani is 3,726 metres high and is the second-tallest volcano in Indonesia. It’s also one of the most active volcanoes on the island. This is one of the country’s greatest hikes, but it’s not an easy one. The trek to the top and back takes three or four days—there are starting points in each of the twenty-something villages around the mountain. On the way, you can enjoy wonderful forest scenery and waterfalls while at the top, the Segara Anak is the star attraction, a blue crater lake shaped like a crescent. 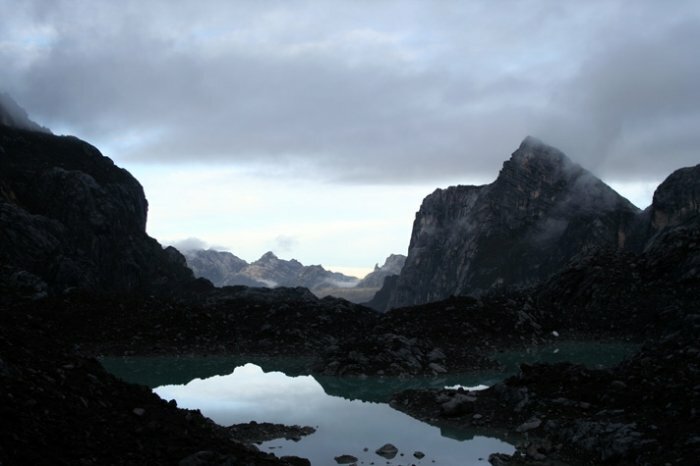 Towering 4,884 metres above the landscape of Papua, Puncak Jaya, also known as the Carstensz Pyramid, is the highest mountain on the Australian continent. It’s one of the Seven Summits of the World, which encompasses the highest peaks on the seven continents. The highest point between the Himalayas and the Andes, Puncak Jaya is also the world’s tallest island mountain. Beware, though, that ascending it is only suitable for experienced and highly skilled climbers.